Free Samples Dissertation: Does Corporate Social Responsibility Enhance Corporate Reputation? Afraid of Drafting Lengthy Dissertation Papers? Submit a Remarkable Dissertation Paper by Availing Dissertation Help from Our Experts. In the present global scenario people demand the companies to be socially responsible in their activities. Various stakeholders of British Gas, UK, has now demanded the use of sustainable and environment friendly business process (Kotchen, 2009). The company has introduced the Energy 360 approach that offers a complete package of products that will help the stakeholders and the users of the British Gas products to reduce the energy consumption by 10%. According to Kitzmueller and Shimshack (2012), the adoption of CSR has now become a major issue for the companies because by enhancing the corporate position of the company the CSR activities also brings in a support from the community, minimises the risk of any crisis and finally initiates employees engagement for the company. 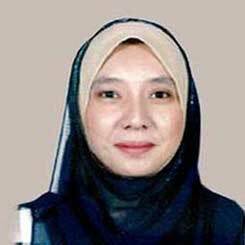 Currently the company is building a high valued CSR activity segment so that it can gain the rust of the stakeholders. The major initiative taken by the company in this respect is to produce energy with lower carbon emission, treating the customers fairly by effectively pricing the services and communicate effectively with the various stakeholders. The main aim of the researcher is to focus on the CSR activities undertaken by British Gas and its influence on the different external and internal aspects of the company. The researcher will try to analyse the positive and the negative impact of CSR activities and also cost and the problems faced by British Airways in order to implement the CSR activities accordingly. How effective are the CSR activities of British Gas? What challenges are faced by British Gas in order to implement the CSR activities? How can British Gas upgrade their CSR activities? The biggest UK energy supplier British gas, serves around twelve million households by supplying energy resources in UK. The company incorporates the normal CSR activities like the reduction of the greenhouse gas emissions, cost effective energy process and use of the legal regulations to showcase energy certificates for the stakeholder’s satisfaction (Barnett and Salomon, 2012). The major issue faced by British Gas is the ineffective CSR activities that are adopted by the company. The lack of high quality CSR activities are impacting on the goodwill of British Airways (Lyon and Maxwell, 2011). Apart from this British Gas also faces the problem of high cots in implementing the CSR activities within the company. The researcher has highlighted this as an issue because in the present context the customer and the employees are having high demands from the companies in respect of a sustainable environment (Kitzmueller and Shimshack, 2012). Hence British Gas is forced to adopt the CSR techniques in order to enhance their corporate reputation. In the present scenario this is an alarming issue for the company because the revenue of the company has decreased by 1.2% due to the loss of the goodwill. The lack of the well formulated CSR activities is making the company lose its market share to local energy companies (Kim and Lyon, 2011). Moreover the company has to incur high operating costs for the implementation of the CSR activities and in return it is not benefiting form the adoption of these activities. The research will help the management of British Gas to analyse the ways in which the company can enhance the level of its corporate social responsibility. This will also shed light on the degree of effectiveness of the present CSR activities of British Gas (Muller and Kräussl, 2011). The researcher in this part of the project has highlighted the various approaches and the philosophy adopted for conducting of the research project. The selection of the post positivism philosophy, deductive approach and descriptive research design will help the researcher to complete the project effectively. The researcher here has adopted the post positivism philosophy while making the data analysis of the given project. According to Mertens (2010), the post positivism approach shows that the researcher of a project should include both scientific analysis as well a common sense analysis in order to arrive at a fruitful conclusion. Hence the use of the post positivism philosophy will enable the researcher to collect the data from the respondents in a scientific manner and then analyse them using common logical sense. The two major approaches used for research projects are namely deductive and inductive. The researcher here will use the deductive approach so that the researcher is able to derive conclusions based on the proposed theories and observations. Greene and Hall (2010) opined that the inductive approach is used when a researcher aims to generate a new idea in the context of the research topic. In this research the researcher is focused on analysing the effectiveness of the present CSR activities hence the use of the deductive approach is suitable for deriving at the conclusions rather than establishing a new concept with the use of the inductive approach (Lo, 2009). Generally three types of research designs are used for framing of the research project namely the explanatory design, exploratory design and the descriptive design. Both explanatory and exploratory designs are used in situations where the researcher is not able to ascertain the particular objectives of the research. Lo (2009) opined that use of the descriptive design is generally seen in cases where the researcher has certain pre determined objectives and are willing to conduct the research project using the predetermined objectives. Hence in this case the researcher will use the descriptive research design so that the researcher is able to conduct an in depth analysis of the CSR activities of British Gas and arrive at the conclusions with the help of statistical as well as scientific tools. Moreover Teddlie and Tashakkori (2010) opined that use of descriptive data helps the researcher to collect primary data from a huge range of respondents thereby improving the quality of the research. Two types of data are majorly collected in a research process namely Primary data and secondary data. McLeod and Thomson (2009) opined that primary data is collected by the questionnaire survey of the respondents and the secondary data is collected from the information published in the company websites, academic journals and other social blogs and news releases. In this research the researcher will focus on both primary as well as secondary data collection methods for the purpose of collection of data to analyse the effectiveness of the CSR activities on the corporate position of British Gas. The researcher will collect the primary data by conducting interviews of the customers and the managers of British Gas (Bledsoe and Hopson, 2009). The secondary data will be collected by the researcher form the various published academic journals on the CSR activities of British Gas and also from the official website of the company. The researcher will use both qualitative as well as the quantitative research techniques to collect and analyse the primary as well as the secondary data collected (Mertens and Wilson, 2012). For the purpose of good quality of the research project the researcher will use the quantitative technique for analysing the responses of the customers. The researcher will take the interview of 20 customers and the interview of 3 managers. For the purpose of analysing the recorded response of the managers the researcher will use the qualitative technique and for the purpose of analysing the responses of the customers the researcher will use the statistical tools under the quantitative techniques (Teddlie and Tashakkori, 2010). The researcher generally uses two types of sampling methods namely Probability sampling and non probability sampling. According to Hollway (2009), in probability sampling the researchers elects the respondents randomly without following any certain type of selection pattern however in non probability sampling the respondents are selected on a purposive basis. The researcher here has adopted the random probability method in order to select an customer or manger from the entire target population. This gives the respondents in the target population an equal opportunity of getting selected (Mertens and Hesse Biber, 2013). The researcher here notifies that during the process of data collection and completion of the research project the researcher has abided by the ethical norms pertaining to the research project. The researcher has ensured that confidentiality of the respondent’s personal information as well as the primary data is maintained in the research project. Moreover the researcher also confirms that the interviews were not collected against the will of the interviewers. The researcher further confirms that the analysis made was according to the guidelines of the university (Teddlie and Tashakkori, 2010). Moreover the researcher also ensures that the responses collected from the respondents are unambiguous and no kind of mental or physical harassments are done to influence the response of the respondents. How often do you avail the services of British Gas? The researcher focused on this question to analyse the number of times the customers avail the services of British Gas. Around 40% of the customers are of the opinion that they avail the services of British Gas only once in a year. This shows that the company is losing its customer base due to the fact that the company’s CSR activities are not up to the standard. Around 30% of the customers generally avail the services of British Gas especially in case of the energy safety policies of British Gas. Do you agree that the CSR activities of British Gas are effective in promoting high corporate reputation? The researcher used the above question in order to understand the satisfaction level of the customers ion respect to the CSR activities implemented by British Gas. The result shows that around 30% of the total respondents believe that the CSR activities of British Gas are not effective in promoting the corporate reputation of the company. Do you feel that British Gas should increase the quality of standard of their CSR activities? The researcher posed this question in front of the customers to judge the satisfaction level of the customers with respect to the standard of quality of the CSR activities implemented by British Gas. The responses show that 45% of the customers strongly agree that British Gas should increase the quality of their CSR activities. They are of the opinion that the present CSR activities are not suitable enough to enhance the goodwill of the company. 20% of the customers agree to the point that the quality of the CSR activities implemented by British gas are not as per the standards of the other companies implementing the same CSR activities. However a change in the opinion is also noted in case of around 25% of respondents who feel disagrees to the above point. They are of the opinion that the CSR activities are quiet appropriate and British Gas doesn’t need to increase or make any changes in the quality of those services. 10% of the respondents are neutral in case of their opinion about any kind of CSR activities implemented by British Gas. How would you rate the CSR activities of British Gas? On being asked about the rating of the CSR activities implemented by British Gas the above responses were recorded by the respondents. The researcher used the 5 Point rating scale to record the responses of the customers. On a scale of 1 to 5 where 1- poor, 2- Fair, 3- Good, 4- very good and 5- excellent, around 35% of the customers rated the CSR activities of British Gas as Fair and 25% rated the activities as Good however the other customers are of the opinion that the activities are not up to the standard. Only 10% of the customers are of the opinion that the services offered by the company are excellent are fruitful for the society and the community. Which of the following CSR activities do you think British Gas should implement in future years? The researcher used this question to analyse the opinions if the customers in relation to the future growth of British Gas. The researcher in this question asked the customers to give their opinions about the types of CSR activities they think should the company adopt in future so that they can enhance the corporate goodwill. The researcher for the ease of the responses provided the customers with some of the general activities that are undertaken by other competitor companies. Around 40% of the total respondents are of the opinion that the company should make the CSR activities public. That is the company should notify the stakeholders like the customers, employees, shareholders and the suppliers about the individual CSR activities adopted for the respective groups. 25% of the customers are of the opinion that British Gas should generate more range of products that would be environment friendly and that would reduce the pollutions and the environmental problems. Again 20% of the customers are of the opinion that British gas should improve the product designs so that they can produce those products that will improve the quality of the environment. Only 5% of the customers opined that the control over the suppliers product quality s necessary for the maintenance of a sustainable environment. What according to you are the advantages faced by British Gas in respect of implementing the current CSR strategies? The three managers on being asked about the advantages that British Gas incurs by implementing the CSR strategies gave the following responses. They were of the opinion that the use of the strategies helps to win the trust of the customers and hence increase the number of customers for availing services of British Gas. One of the mangers was of the opinion that the CSR activities help the company to enhance the relationship with the suppliers, employees and customers as well. Further the manager added that British Gas by implementing the different policies like the Energy 360 approach are able to produce energy products from the plant energy which is giving the company a competitive advantage over its competitors. The third manager opined that the use of the sustainability within the products has helped British Gas to generate innovation and also save money on the energy producing goods and help to mitigate risks for the production of the energy products. The third manager also opined that with the introduction of the CSR activities British Gas has recently been able to generate a positive publicity within the community and this has increased the revenue of the company. Moreover the mangers are also of the opinion that the use of the CSR activities has helped British Gas to get easy access to the capital and the credit requirement for financing of the long term projects. What according to you are the challenges faced by British Gas while implementing the CSR activities? On being asked about of the challenges faced by British Gas for implementing the CSR activities the manger focused on the following problems. The first manger is of the opinion that the company generally has to suffer from financial problems in case of implementation of the CSR activities. The use of the plant resources to produce the electric products has made the company incur high cost of production for these products. Hence the manger is of the opinion that the budget incurred for the CSR activities are excluded from the direct operating expenses of the company and are regarded as an extra expense for the company. The second manger added that another disadvantage faced by British Gas is that the focus of the company shifts from the main concerns of the business. The higher authorities and the employees become more focused on making CSR strategies for the sustainability creation of the company. This makes the long term and the short term goals of the company unachievable. The third manger highlighted various small issues that British Gas faces in terms of implementation of the CSR activities. One of the issues is that the company has to recruit more employees for the implementation and the CSR strategy formation. The employment of extra staffs indicates that the company has to incur high administration costs. The manger further added that British Gas has to price the products in accordance to the cost of producing the products. The adoptions of sustainable production process increase the cost of production and hence the price eventually increases. Further the mangers added that British Gas is also facing problems because of the lack of the knowledge and lack of institutional assistance for implementing and generating fruitful CSR activities. What factors do you feel will improve the current CSR activities of British Gas? The mangers are of the opinion that to improve the current CSR strategies British Gas needs to focus on the demand of the customers and the communities. Instead of spending on the energy resource plans the company should concentrate on making policies for the energy conservation. The company can also make more sustainable products which are environment friendly as well as more profitable in terms of costs for the company. The mangers mentioned certain number of points in this respect that they feel should be adopted by the British Gas so that they can improve the CSR activities. The researcher in this part of the research has established a link between the proposed academic theories and the research results. According to Fernández and Souto (2009), the use of this theory will help the organisations to identify the individuals who would be affected by the functions and products of the company. Hence the company will need to generate responsible services for these categories of individuals. Carroll and Kareem (2010) opined that by satisfying the internal and the external stakeholders the company can eventually increase the profits. The incorporation of the stakeholder ethics will help British Gas to enhance the corporate goodwill. The main aim of the theory is to make the organisations approach towards the human welfare and in turn increase the profit of the company. The survey of the managers and the customers, two of the major stakeholders of British Gas was done to understand their satisfaction level in relation to the current CSR activities (Borzaga and Becchetti, 2010). By analysing the results it can be concluded that the company needs to implement welfare activities like the safety programmes, reduce working hours, development of hazard free product of the welfare of the stakeholders. This will thereby create a positive influence as well as increase profit of the company. This theory focuses on the impact of the CSR activities on the overall performance of the business. The Utilitarian theory focuses on the influence of CSR activities on the social costs of the organisation. Taylor and Williams (2009) opined that the managerial theories determine the corporate social performance, social accountability, auditing and reporting and also the social responsibility of the organisations. The relational theory focuses on the business and society, stakeholder approach and social contact theory. The adoption of this theory helps the organisations to separately concentrate on each segment of the business and frame the CSR strategy separately for the target audiences. However Arevalo and Aravind (2010) opined that a business with a profit maximisation concept will not be able to apply the theories to establish the correct CSR policies (Reinhardt And Stavins, 2010). Gain with the help of the corporate relationships the company can determine the type of community it is meant to serve and thereby can generate and formulate the CSR policies in accordance to the community welfare needs. According to Taylor and Williams (2009), the classical theory of the profit maximisation states that the modern economic system is made of three components namely market, firms and state. Hence the firm’s major motive should be profit maximisation. However to maximise the profit the firms need to first adopt social responsibility towards stakeholders. In the present scenario the firms are seen to adopt different CSR strategies for different types of stakeholders. However Karaibrahimoglu (2010) opined that the classical theory states that the focus of the firm should be on the minimal use of the resources to generate activities in order to increase profit. Muller and Kräussl (2011) opined that by following this theory the companies are required to carry out social responsibilities only for the shareholders and not the other groups of stakeholders. However Griseri and Seppala (2010) argued that in the current circumstances the application of this theory will lead to a loss of the reputation of the company and this may reduce the customer base and also make the company undesirable in community. The corporate reputation is directly related to the market value of the firm. Hence to enhance the reputation the organisations are taking the help of the community services in shape of CSR activities. De Cremer and Trenbrunsel (2011) opined that the corporate reputation has a direct impact on the investor’s portfolio and the investors before taking decisions generally analyse the CSR report of the companies. The effective management of the corporate governance and social and environmental risks will make the reputation of the companies’ positive for the investors. Muller and Kräussl (2011) opined that it is essential for the companies to grow the corporate reputation by implementing CSR strategies because the corporate reputation also affects the customer purchase intention. An effective CSR report will help the company to evaluate the customer’s needs and satisfaction levels. The organisation in the present scenario has to follow a multiple stage model for the effective implementation of the CSR activities. De Cremer and Trenbrunsel (2011), opined that the following of the six stages namely mission driven approach, product driven approach, cultural approach, individual advantage, communicational advantage and organic partnerships will help the companies to effectively implement the CSR activities. In case of the mission driven approach the company will focus on the brand promotion through the incorporation of the CSR activities. The core value of the company will be judged in order to implement the strategies. The product driven approach encourages the companies to develop sustainable products which are good for the society and also develop products that will reduce the pollution of the environment. Carroll and Kareem (2010) further added that the adoption of cultural approach will help the company to generate the CSR strategy keeping in mind the cultural diversity of the employees. The major model that should be adopted by all companies is the individual advantage model where the company will be able to generate a strategy which is unique to the company’s activities like the adoption of the Global Reporting Initiative, UN global Compact etc. With the adoption of the communications model the company will be able to generate CSR strategies in the communications department of the organisation. To maintain this organisation will have to develop new department like corporate communications, community relations and professional relations. Finally the use of the organic partnership will help the company to develop a separate branch for formulating the effective CSR strategies (www.unido.org, 2014). The researcher here focuses on issues that British Gas is facing in implementing the CSR policies within the organisation. The researcher after analysing the collected primary data and with the help of the secondary data has reached to the conclusion that British Gas is not implementing standard CSR activities. The rating of the customers shows that the company is not following a suitable strategy for the social benefit of the customers both in terms of products as well as services. Keeping in mind the ratings and the opinion of the customers and the manager the researcher has tried to formulate some of the recommendations for the higher authority of British Gas. Development of Sustainable products: The Company should pay attention to the development of more innovative range of sustainable products with the help of the plant and biodegradable energy resources. This will help the company to not only produce the products in a costs effective manner but also help British Gas to reduce the waste and the other bio degradable products. Adoption of social accounting system: The Company should adopt the social accounting system under the Global Initiative reporting system so that the related stakeholders like the employees, shareholders, investors and customers are kept informed about the CSR activities of the company. British Gas will be able to enhance the corporate reputation by presenting a public CSR report for the NGO’s, Charities and the government agencies. Use of social media to enhance sustainability: British gas has introduced the new concept of reducing the prices of the energy bill for the poor and deprived part of the population. This is a positive social activity adopted by the company. However due the lack of the awareness of this initiative the company could not benefit from the CSR activity. Hence it can be recommended that the company should use the social media websites like the face book, twitter and blogs in order to promote its CSR activities. Development of safety policies for the employees and the customers: One of the major stakeholders that are affected by the CSR activity of British gas is the employees. Hence the company should first see to the satisfaction levels of the customers. For this the company can introduce various forms of safety policies in accordance to the workplace safety regulations. The safety policies should ensure rules relating to the machineries used in the energy production, the safety legislation policies for the gas and other energy products handling. This will make the employees and the customers dependable on the services of the company and will also enhance the goodwill of the company. The time frame of the research will help the researcher to complete the study timely and in a cost effective manner. Hence the researcher at the beginning if the research project sets out the Gantt chart for the simplification of the research process. In the present research the researcher has adopted the cross sectional study and applied the Gantt chart that helped in segregating the tasks as the structure of the study and helped the researcher to complete the project on time in an easy manner. 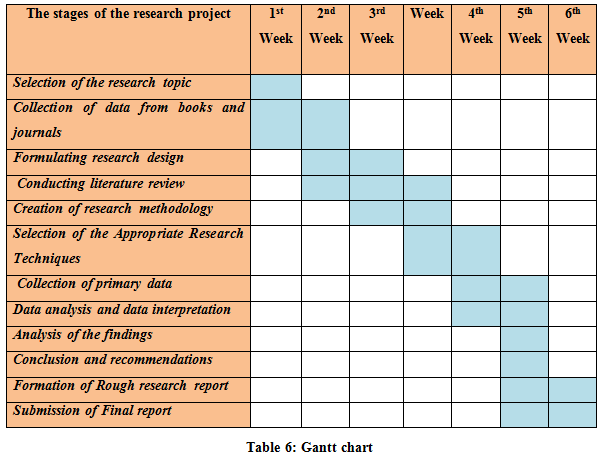 The Gantt chart below shows that the researcher will take the appropriate weeks for the completion of the different tasks under the research project. The research study is subjected to various limitations in its process that hampers quality of the analysis of the research. These are generally the non avoidable limitations that the researcher has to face in the process of the completion of the research project. Here are some of the major limitations that were encountered by the researcher in order to complete the research project. Lack of respondent’s co operation: The researcher faced problems in getting responses from the managers as well as the customers of British Gas. It was difficult for the researcher to take the interview of the managers of British gas because they were not co operative in the process. Hence the responses thus recorded were of poor quality. Time constraint: The researcher had proposed to take interview of around 50customers in a 10 mile radius and 20 managers in a 5 mile radius. However since the researcher was required to complete the project on time hence the keeping in mind the time constrain the researcher had to reduce the number of respondents to 20 and 3 respectively. This affected the quality of the primary data collected.